I feel I should preface this post with the affirmation that I believe our Christian worship services should be characterized by decency and order, and that God has given us a human capacity to plan and organize for the express purpose of planning and organizing – including worship services. And now that I have that disclaimer out of the way, I also believe that the Holy Spirit has the right to take a worship service in a completely different direction than we had planned – and when that happens it is best if we just go with the flow. And that is what happened on Sunday. I confess that as I write this, I’m not exactly sure where to start. Perhaps I should start on Saturday morning. That was when I received a call from a colleague who is on vacation, asking me to visit a man from his church who is in the hospital and facing an uncertain future. This is important for Sunday, because it got me thinking about what differentiates Christians and non-Christians as they face severe trials. As I pursued this line of thought, I came up against Romans 5:1 – “Therefore being justified by faith, we have peace with God through our Lord Jesus Christ”. I’ve written here before about the awe-inspiring concept of peace with God. The far-reaching implications of this seemingly basic concept of Christianity continue to amaze me. As I shared this passage with the man in the hospital, it was obviously a tremendous encouragement to him as well. Fast-forward to Sunday. I was putting the finishing touches on my message, a continuation of the series we are doing in Luke’s gospel. As I studied, I received two pieces of information: 1) That one of our families wanted to give a testimony, and 2) That there would be several unsaved people in attendance. So I began organizing the service around these new developments. I’m nothing if not flexible. At this point I feel I need to do a little more context – but rather than write it all out here, you can read this post. The family that was to give their testimony that night was mentioned in the article I just linked – the one with the daughter who came down with a mysterious disease that had the doctors stumped. Yesterday was their first Sunday back from São Paulo, where they had been seeking treatment for her. When we arrived at church, we were surprised to see another of the main characters from the August post – the young woman who fractured both feet in the automobile accident (if you haven’t read that article, you really should do so now. Otherwise, you won’t get the impact of what happened next). She is still in a wheelchair, but the fact that she was in church was a surprise, and a huge encouragement to all of us. The service began ordinarily enough. 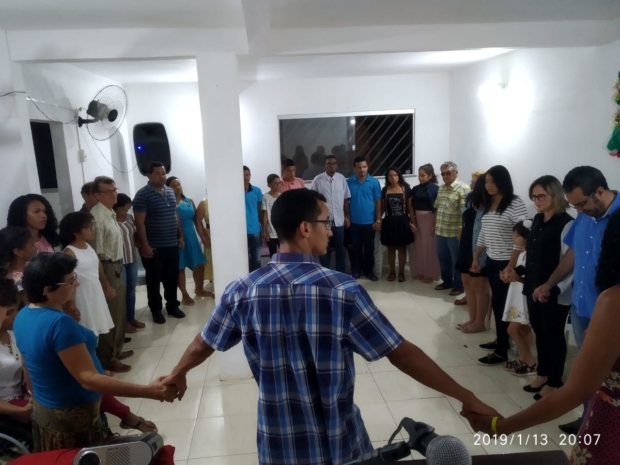 Songs, announcements, hugging time (this is Brazil, after all)…then, just before the service, I called the Vasconcelos family up to give their testimony. They filed to the front, and one by one, mother, father, and daughter gave tearful testimony to how God had worked in their lives through the trials of the last few months. 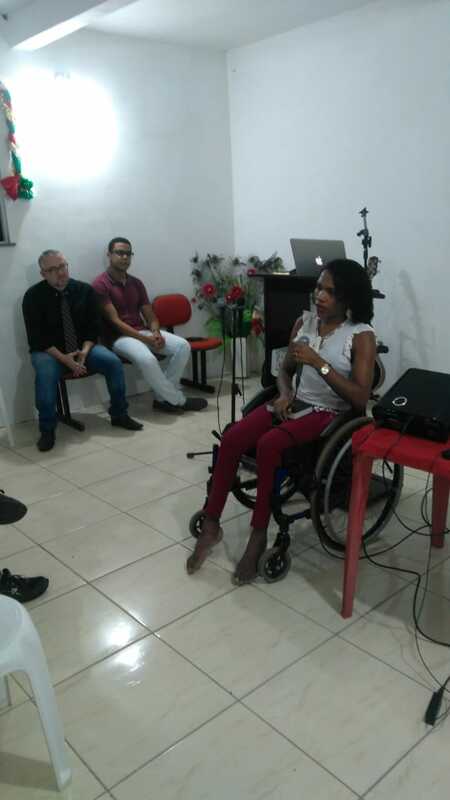 God put the right people in the right places, and their little girl, who boarded the plane to São Paulo in a wheelchair, deplaned last week on her own two feet, walking and jumping and praising God. Mind you, their testimony was not only one of gratitude that God had carried them through the storm, but for what God had done along the way as well. 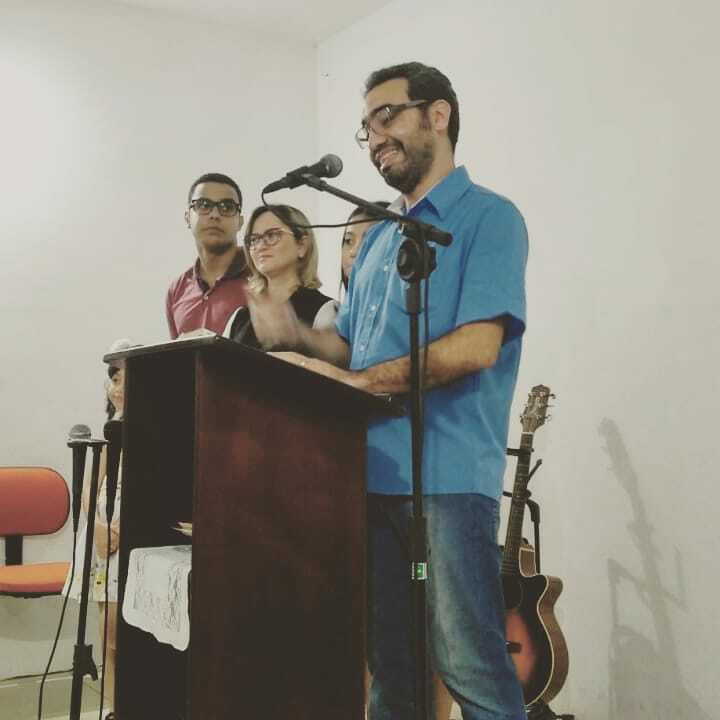 The Vasconcelos family, giving testimony to God’s greatness. But that’s not the end of her story. After the surgery, the doctors took x-rays of her feet, and to their great surprise they saw that the pins were exactly where they should have been, not where they had put them. “You’re lucky!” they said to her. “It’s God,” she replied. As she wheeled her way back to her place, I sat there looking at the outline I had prepared. It’s a great passage in Luke 6, but completely irrelevant to what we had just witnessed. It was then that Romans 5:1 came back to mind from my Saturday visit to the hospital. With no real plan I stood in the pulpit and asked the congregation to turn there. I looked at the unsaved people in our midst (at least six that night) and asked them what made the difference in how a believer responded to trials, and how an unbeliever responded. The answer, of course, is found in that one simple line. We have peace with God. And peace with God puts all earthly trials into perspective. I don’t know what impact my words will have on their lives. I do know that as I unpacked that passage I had their undivided attention, and it had nothing to do with my limited rhetorical skills. It was all due to the living testimonies they had just heard. At Ebenezer we have a custom. When members of our church are facing trials, or when we have something for which we are especially grateful, we all gather in a circle after the service for a time of prayer and song. We have done this many times over the last six years as God has taken one or another of our members through deep waters. Too many, in fact, for me to remember them all. But this one…this one will never be forgotten by anybody who was there. And that’s what happens when the Holy Spirit takes over a service.